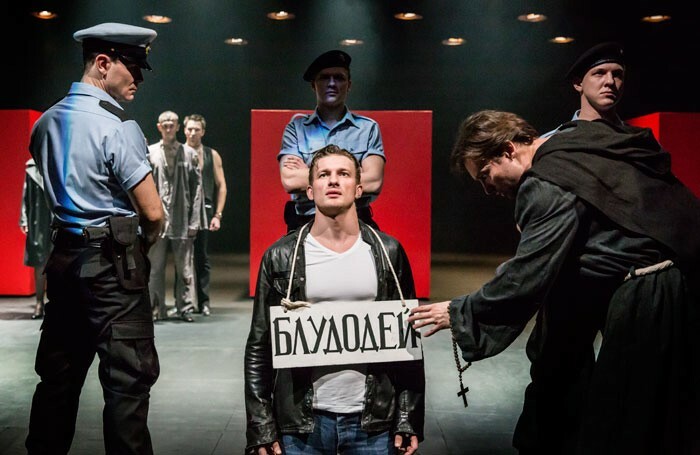 Cheek by Jowl brings its Russian company to the Barbican – performed in Russian with English surtitles – for a piercing production that makes sharp work of Shakespeare’s muddled play, turning it into an insightful take on modern Mafioso politics. In Declan Donnellan’s dizzying production it also becomes a periscope through which to look at a world where morality has increasingly been turned on its head. Leaders who don’t know how to lead, bureaucrats lusty with power and nuns tainted by violent emotional circumstance swirl around one another, calamitously crashing into each other like errant atomic molecules. This is a world in which government is chaotic; perhaps it’s not so far removed from our own. Nick Ormerod’s gorgeous set of imposing blood red cubes and industrial lamps allows Irina Kashuba’s elegant choreography to stretch its legs. The cast of this merry-go-round society are always present, swooping and swerving like a flock of birds around a series of minimalistic, potent scenes. The performances, taut and tensely heightened, are scored through with powerful emotional charges that threaten to erupt at any moment. When they do, the result is hypnotic, a sort of balletic naturalism that marries the humanity and caricature in Shakespeare’s characters. Anna Khalilulina’s sinewy Isabella is a powerful woman, shining with an integrity that’s impossible to resist but we also see her as a tear-stained wreck. Alexander Arsentyev’s Duke oscillates wildly between smooth leader and insecure autocrat. Interestingly, in this topsy-turvey world Andrei Kuzichev’s slimy Angelo appears to be most at ease with himself; he’s a villain but at least he knows it. It all ends well to be sure, but whether any of them are happy is another question.